Béla Bartók’s six string quartets are a cross-section of his musical development. Over 30 years, 1909 to 1939, the Hungarian composer can be heard working his way through the musical trends of the first half of the 20th century. A late Romantic in the mold of Liszt and Wagner, Bartók became a modernist through his study both of pre-tonal folk music from Hungary and other countries, and of post-tonal incorporation of dissonance. The gold standard for the Bartók quartets up to this point, live and in two versions on disc, has been the Takács Quartet, which gave an exemplary performance of the entire cycle at the Kennedy Center in 2014. The Jerusalem Quartet excels in 20th-century repertoire, including its fine partial traversal of the Shostakovich quartets. To judge from the first disc of its new recorded Bartók set, with the even-numbered quartets, the group’s account will not displace the Takács but promises to be in its league. The second quartet receives the most convincing rendition, especially the dizzying fluidity in the dancing rhythms of Arabian folk dance in the second movement. One of the first movement’s principal motifs, outlining a minor third in stepwise motion, receives just the right caressing attention from all four players. The success of the fourth quartet rests on the gently creeping night music of the slow movement, the centerpiece of five movements written in palindromic form (a Bartók signature). 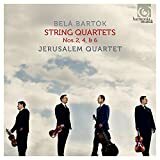 The Jerusalem Quartet does not captivate with an eclectic variety of sound like the Takács, and the conclusion of the fifth movement feels too polite to be bloodthirsty. On the other hand, the quartet creates a fun interplay of Stravinsky-esque metric shifts and off-beat accents in the first movement. The inner movements are the most delightful — a restless, questing Prestissimo in the second movement, with mutes on, and an astounding variety of plucked sounds in the fourth movement. No. 6 is a piece steeped in sadness, composed just before Bartók was compelled to flee Europe for an unhappy few final years in New York. Laments (marked Mesto) open each movement and become the central subject of the finale. The solos that permeate the work are all polished, perhaps too polished. One misses the quirky individualism of the Takács Quartet’s approach.